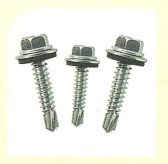 Leading Wholesale Distributor of fasteners from Chennai. We are engaged in Supplying of branded, quality fasteners to our clients. As fasteners play a major role in the entire shed, care should be taken to use quality material. If poor quality fasteners are used, there are chances for the sheets to fly away, or they could be the first product to corrode and it will quickly spread to the sheet and then to the members. Besides this, it will also lead to water leakage.